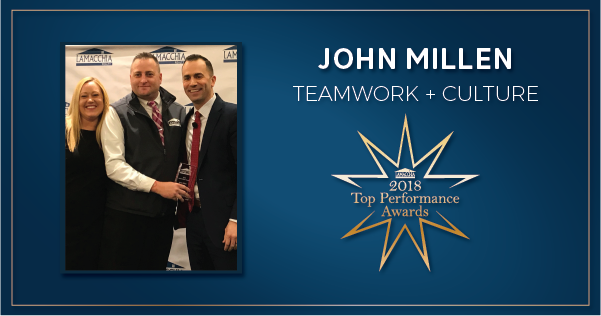 January 17th, 2019 – Lamacchia Realty proudly announced John Millen as the first ever winner of the Teamwork and Culture award! John is a lifelong resident of central Massachusetts giving him extensive knowledge of the region and an enormous network. He was a Realtor with Lamacchia Realty but in March of 2018, he officially became Lamacchia Realty’s Worcester based Business Development Consultant. In this position, he consults Realtors at Lamacchia Realty on best practices for growing their businesses and promotes and enhances the company’s Realtor development in the Worcester County Market. “John has been a tremendous asset to our company since the day he joined us. He had a ton of sales his first year and then moved into business development where is truly a natural. He naturally exudes everything Lamacchia Realty is all about on a daily basis, being a team player, helping others and doing everything he can to support our agents and staff. I am grateful to have him with us,” said Anthony Lamacchia, Broker/Owner. He exemplifies the words teamwork and culture. John is always willing to help out anyone in the company whenever an agent or staff member needs something and is always thinking of fun ways to get the groups together which is why he was our choice for this award! John is also known for his very active Facebook page where he posts a lot of valuable content for buyers, sellers and Realtors alike. To learn more about John, click here!